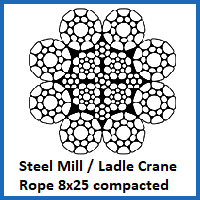 Our 8×25 compacted steel mill rope for steel mill cranes and ladle cranes comes ungalvanised and can be ordered in a multitude of diameters and lengths. Rope Services Direct produces quality crane ropes of all kinds and this is just one excellent example of what we can do. Why buy this 8×25 Compacted Steel Mill Rope? Stock up on 8×25 construction rope to replace worn our parts on your lifting equipment in a steel mill. This compacted wire rope will run smoothly through the crane assembly, keeping loads steady and preventing hazardous molten metal spills. As well as being strong enough to withstand significant weights, pressures and temperatures, the construction of this wire rope means that it will also avoid the likelihood of combustion occurring. You can order this rope in diameters of between 13mm and 24mm. It is not galvanised, like some of our other wire ropes, which is worth bearing in mind if you intend to use it in other industrial settings. Our wire ropes for mobile cranes are just as carefully designed and cleverly manufactured as those for tower cranes, giving our customers ultimate freedom of choice and confidence in our products. We also supply this rope in an 8×25 construction and we can also fit numerous end fittings from our vast range. To find out more about our wire rope for steel mill and ladle cranes, call 01384 78004 to talk to a member of the Rope Services Direct team. Our email address and other contact details can be found on our contact page. 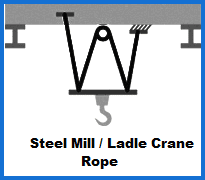 8x25 Compacted Steel Mill Rope / Ladle Crane Rope Overall rating: 5 out of 5 based on 6 reviews.